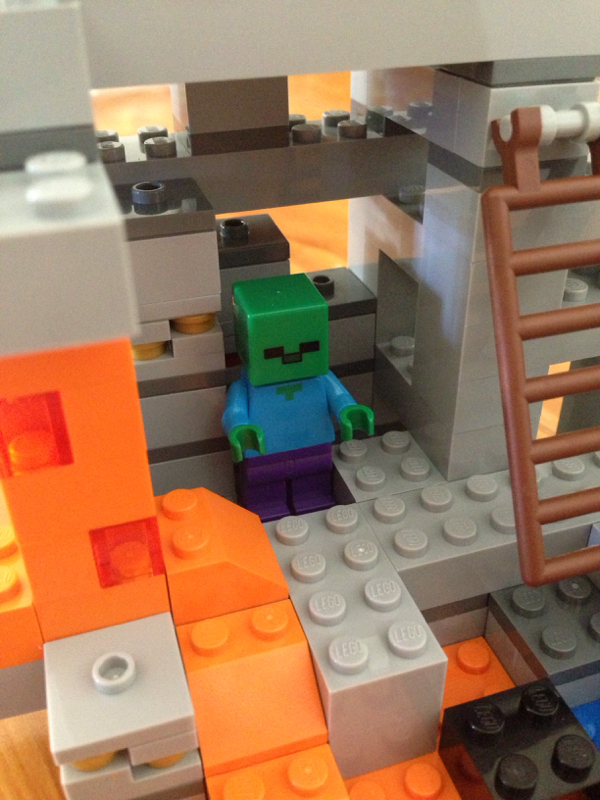 LEGO and Minecraft seem like they should be great together, and it’s true – it really works. Both are fueled by imagination, are centred on blocks, and are great for all ages. 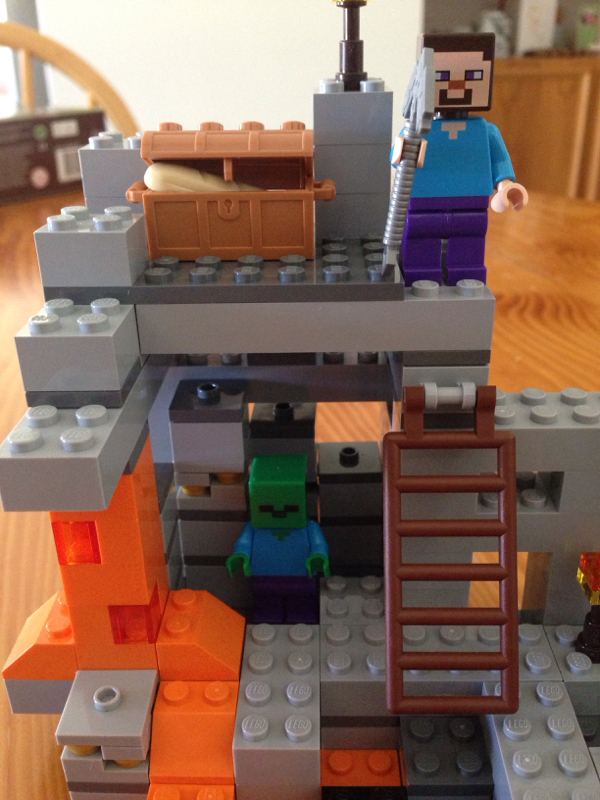 The new LEGO Minecraft minifigure scale sets are a great addition to the range, but this one is the simplest of the bunch. The others appear to be more vibrant and interactive, whereas this one looks a little haphazard and not as interesting as I’d originally hoped. 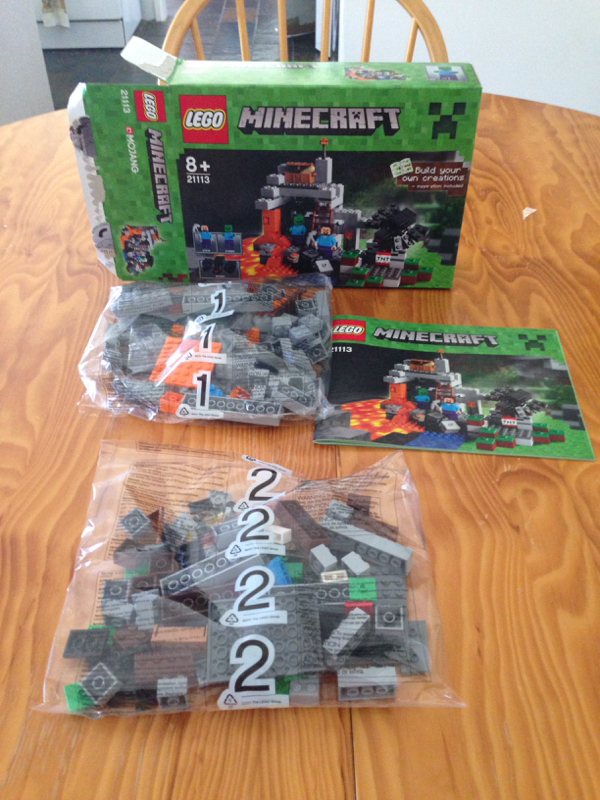 Out of the box there are 2 bags of pieces and an instruction booklet. The box itself is very eye catching, and now that they’re appearing in stores like Myer and Target, it’s easy to spot them. Obviously, with this set you get a whole stack (43) of 2×2 bricks in various colours. There are also plenty of the 2×2 plates with knobs in the middle, and a few larger plates thrown in here and there as well. 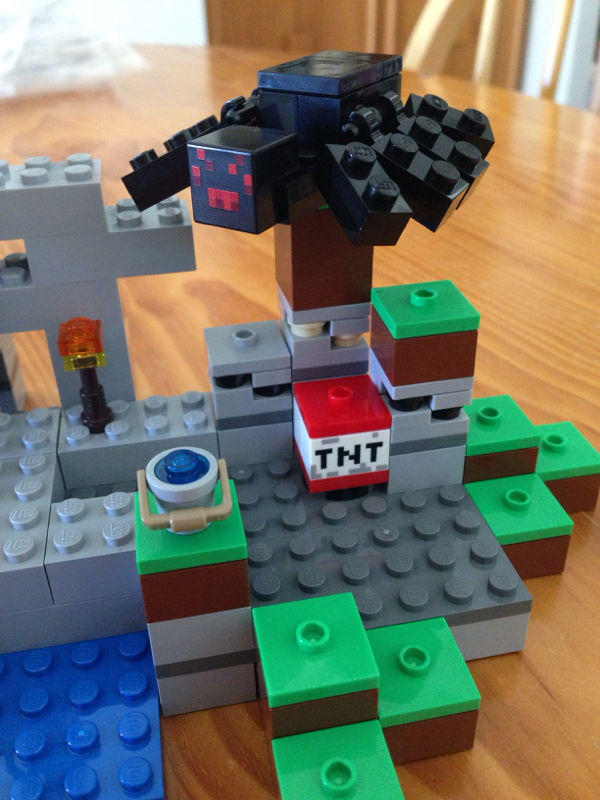 The interesting parts include two black T-pieces, a 2×4 chest and lid in medium nougat, a little bucket (that’s great for holding the 1×1 plates of water and lava, and two 1×2 TNT bricks. The minifigures are pretty cool. 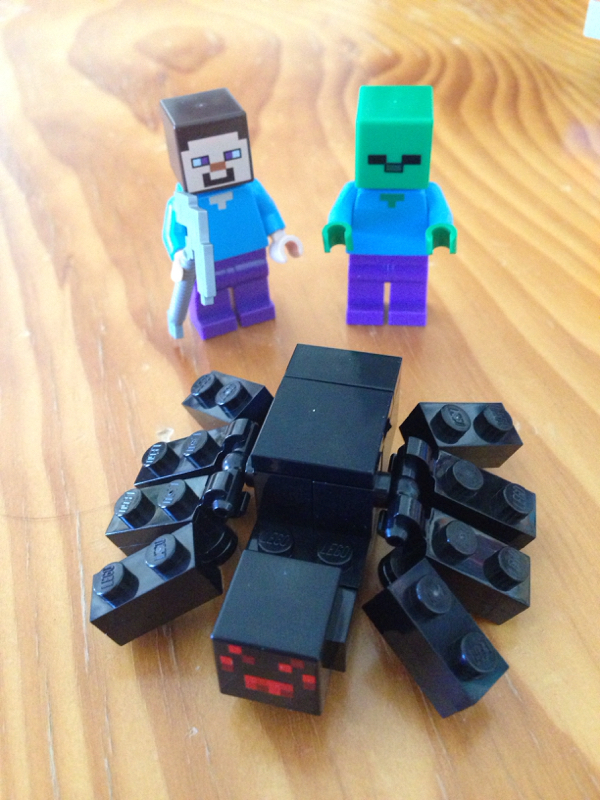 Of course, they have the iconic square heads, and the spider looks pretty awesome. To me the tools look a little too detailed, but that’s a very minor thing. One detail I was really happy with was the bread. I get really excited every time I get a set with some food items in it! The spider’s legs are great – using the black T-piece, a hinge plate and a vertical clip plate was a really clever way of getting the legs looking right. I’m honestly not sure about the large gap between the head and the abdomen of the spider. To me, that could’ve been left out. Because of the way the set is intended to be modular, and fit in with the other sets in the range, it has to be able to come apart easily. This isn’t easy, as the stability of the set is sacrificed. I kept knocking over the walls because of this, and got a little frustrated. The lava flow is a great visual, and the torches just look awesome. For such a simple little detail, they really nailed it. The beauty of this set comes in it’s playability, especially when combined with the rest of the range. I’m looking forward to getting my hands on them soon. This set gets 6 out of 10 buckets. For more LEGO Minecraft excellence, check out the video below of the Guiness World Record attempt at the largest LEGO videogame diorama. 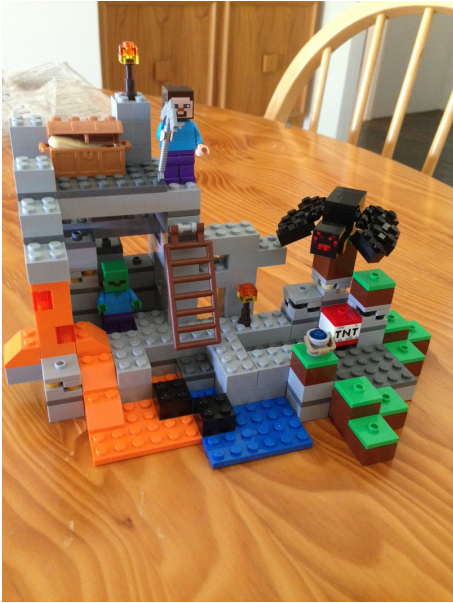 A massive combination of the Minecraft sets. The next review will be 60020: Cargo Truck!